Word is getting around today that Yota Devices, makers of the dual-screen smartphone the Yotaphone, will not be launching it in the US. Having failed to secure a retail or telecom partner in the US, Yota Devices had announced earlier this year that they would launch the US version of the phone on Indiegogo, and ship the phone to backers. Yota Devices launched that crowd funding campaign in June, and by the time it ran its course in late July it had raised almost $300,000 towards its goal of $50,000. That should have been more than enough to build and distribute a US version of the Yotaphone, but alas money was only the beginning of the problems Yota Devices was facing. Yota is now telling Indiegogo backers that the company is facing insurmountable logistical problems. Yota's manufacturing partner in China is unable to meet its promises to produce the US version of the Yotaphone in a reasonable amount of time, and so Yota is cancelling the launch. You can read the letter that Yota Devices sent to backers over at The Verge, but the tl;dr version is that the backers have the option of either getting a refund or buying the stock Yotaphone instead of the US version. To be honest, I was under the impression that the backers were going to buy that stock Yotaphone when they contributed to the campaign; I truly hadn't realized that Yota Devices had planned to ship a model specifically for the US market. Had I known that I would have told you that the ship date would be delayed by at least a couple months from the planned August release date. Chinese manufacturers are fast but a turnaround time of a month just wasn't going to happen, especially not for a complicated and expensive device like the Yotaphone. 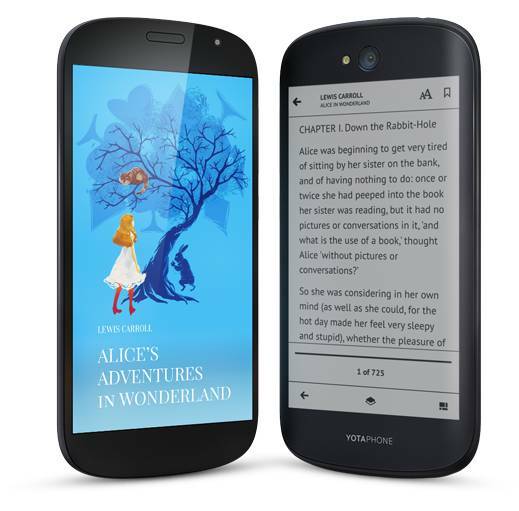 In its current incarnation, the second-gen Yotaphone combines a 5" AMOLED screen with a 4.7" E-ink screen (960 x 540 resolution). The phone runs a custom version of Android on a Qualcomm Snapdragon 801 CPU with 32GB storage and 2GB RAM. Software features include the ability to push data to the E-ink screen, mirror the displays, or run full Android apps (including ebook apps) on the E-ink display. It is a nifty device, and with a retail price of $600 it is also expensive. There was simply no way that Yota Devices could have turned around a US version in under a month, and i wonder what they were thinking. Not thar *I* care about the US version (since I am in Europe), but the liliputing article mentions (in an update at the bottom), that a next-gen Yotaphone is in the works, which is said to carry a lower price tag alongside newer hardware. Looking forward to that. To be honest though, I’d much rather like to see a non-premium phone with current-gen e-ink screen for less than 100 EUR. Could be a dumbphone. The Motorola F3 was cheap from its introduction, but the user interface was rather abysmal, owing to its segmented display (it was even a pain just to read SMS on it). Now, a dumbphone/reader/remote control combo about the size of a Pyrus mini would be something that could be made for cheap. It’s a pity to see the dumbphone disappear, while readers keep mostly rather dumb and smartphones keep less-than-they-could-be suitable for reading. The Yotaphone is nice, but too smart and too expensive.